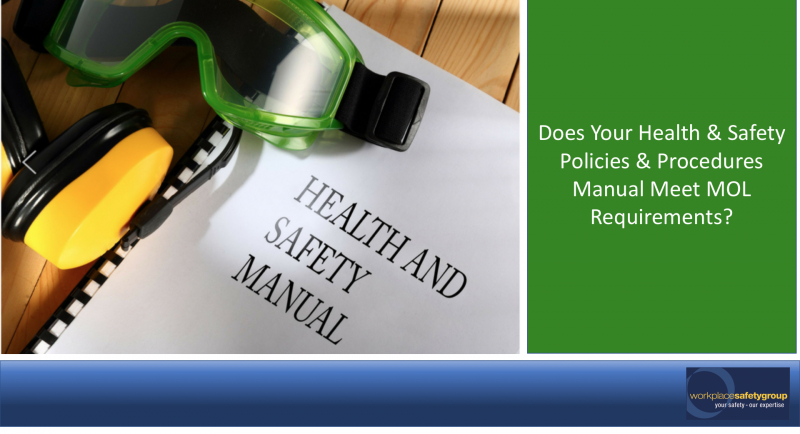 Does Your Health & Safety Policies & Procedures Manual Meet MOL Requirements? Good health and safety policies and procedures are essential elements of running successful businesses. They outline key procedures, communicate expectations, reinforce organizational expectations and ensure legislative compliance. They protect employers during health and safety prosecutions, or liability claims. In short, effective policies and procedures are critical to your risk and compliance strategy. Policy management is the process of creating, communicating and maintaining policies and procedures. It is vitally important to get it right. Poor policy management may result in inconsistent, unreliable and out-of-date documents that no longer align with regulatory standards. A health and safety policy is a written guide that sets the direction of an organization. Health and safety procedures are detailed steps to be followed consistently to achieve a desired outcome. Policy and procedure are often grouped as one because, together they provide direction and consistency. To improve efficiency and reduce risk, a business must create a framework for best-practice policy management. Key when writing the policy is consultation with employees who should have input into the policy; they offer valuable insight into actual work processes. Workers are more likely to adopt the policy when they are involved in its creation. To keep health and safety polices and procedures clear and easy to understand, they should be written in plain language and follow other organizational policies to maintain consistent style, format, and language. It is vital that health and safety policies are effectively communicated to all employees; otherwise, an organization opens itself to safety risks and liability.Employees should know where to find the latest version of a policy or procedure, preferably at a central location that provides a single source of information. A health and safety policy may require formal worker training that includes explaining why the policy was created, what purpose it serves and how it will be enforced. Key to successful policy training is testing for understanding. Companies must demonstrate that their workers understand the policies they’re expected to follow and what is expected of them on a day-to-day basis. Regardless of whether workers needs formal training on a policy, or whether they simply need to read and understand it, companies must have a system to record Policy Acknowledgement and provide documented proof that an employee was provided with information and understood what was expected of them. A policy quickly loses effectiveness if it isn’t continually managed. The policy must be enforced consistently and predictably. Supervisors need to monitor for compliance and make decisions consistently and justifiably. Policy non-compliance violations must be accurately recorded to provide valuable feedback when the policy is next evaluated. It’s important that policies and procedures be treated as living documents that are maintained and adapted to an organization’s growth or as circumstances change. Every policy should undergo evaluation at least annually; however, specific circumstances may require more frequent reviews. The review process should consider documented incidents of non-compliance. Then organizations must consider whether a policy needs to be re-created, or whether it remains effective as is. The proper archiving of policies and procedures is vital in order to protect an organization in the case of an incident, or questions from a regulator. Every version of a policy, along with a complete view of workflow history, needs to be stored in a secure location that can be easily accessed. In the past year WSG has created policies and procedures for several larger companies not only for Ontario but for most of the other provinces. Because each organization’s requirements are unique, a great deal of research and development goes into a project in order to ensure compliance with federal, provincial, regional and local standards and regulations. It is not a “one size fits all” undertaking. 1Let WSG help you get it right. WSG invites you to contact us for help with your policy and procedures development. "Thanks to the Workpace Safety Group Team. The SafeWork Summit was a great day and I hope to attend again."